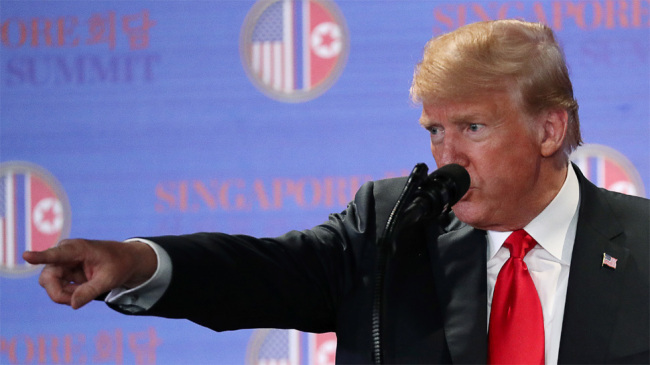 US President Donald Trump said his second summit with North Korean leader Kim Jong-un is unlikely to be held in the United States, although it may happen in the future. Trump reaffirmed in an interview with the AP Tuesday that the meeting will take place after the US midterm elections on Nov. 6. He said he wanted to first "help people get elected." "No, I don't think so," he replied, when asked if the summit could be held in the US "I mean, we haven't set it up yet, but I would think not yet. At some point, that will happen, too." The US and North Korea have no diplomatic relations. Among the possible sites are Sweden, which has an embassy in Pyongyang, and Switzerland, where Kim went to school, according to news reports. Trump and Kim met in Singapore in June in the first-ever summit between the two countries. They agreed that North Korea would work toward "complete" denuclearization of the Korean Peninsula in exchange for security guarantees from the US. A follow-up meeting has been in the works amid persistent skepticism that North Korea is serious about dismantling its nuclear weapons program. Still, Trump has claimed progress in the negotiations, saying the North has suspended nuclear and ballistic missile tests, returned American prisoners, and repatriated the remains of American soldiers killed in the 1950-53 Korean War.